In his 43 years of staying in Whampoa South, this was Stomper Tay's first time seeing a monitor lizard right outside his flat. The incident happened at about 9am on Saturday (Jul 28). Tay's mum, who was heading out, was about to take the stairs down when she saw the creature and told Tay about it. He said: "I first saw the lizard at the foot of the staircase, then it crawled to the front of my neighbour's door. "The lizard remained in front of my flat for about 30 minutes before moving towards the lift. "It moved really slowly, and its stomach was also unusually huge, it might be pregnant or maybe it just ate something. "Quite a few of my neighbours also came out to see, and I heard from them that three cleaners had hit the lizard in an attempt to chase it away. "I also heard them talking about how big the lizard was." Tay also added that he felt a little scared at the sight of the creature. "It was quite huge, about 1.5m. "Usually it would be near the river but I don't know how did it get here." 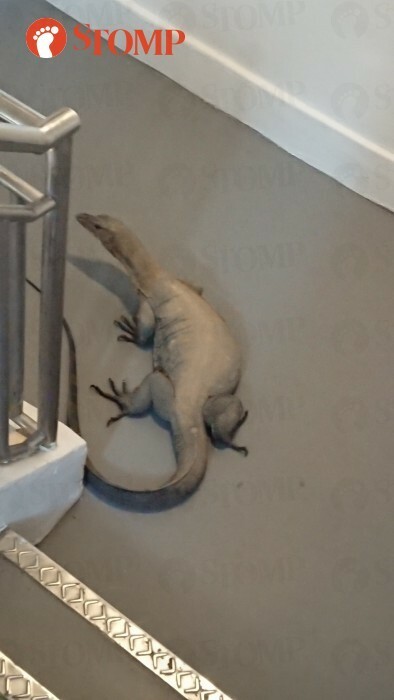 What is this massive monitor lizard doing in Toa Payoh?